The stately colonial building of 11 Mount Pleasant Drive in Singapore is a fitting choice for the treasures that’s on display – the historical setting is home temporarily to 40 exquisite creations from the Van Cleef & Arpels Le Secret high jewellery collection, originally revealed in Japan in June this year with over 100 pieces. Drawing on its proud heritage and cherished sources of inspiration like nature and symbols of love and luck, the French jeweler continues its enchanting narrative this year – but with a twist. Each of the pieces has a little secret to reveal; whether caressed by the eye or the fingertips, they are a delight to open and handle, playfully revealing what lies within. At a mere touch, a precious parrot clip opens up to reveal a baby parrot snuggled up against its mother. In a game of hide and seek, the gemstones on a ring change colours when it is twisted, a long necklace transforms into a shorter version with detachable clips and a bracelet, a sparkling leaf reveals a lucky ladybird, while a dove – enveloped in Van Cleef & Arpels’ famous Mystery Set – rises into the air to deliver a tender message. It’s like a stroll through a secret garden, where the visible and invisible meet. In the maison’s workshops (called the Mains d’Or) with its wealth of technical prowess, one belief is fundamental: beauty should take pride of place over effort. Hundreds of hours are spent at workbenches to perfect every creation and ensure seamless transformations and mechanisms that are effortless. 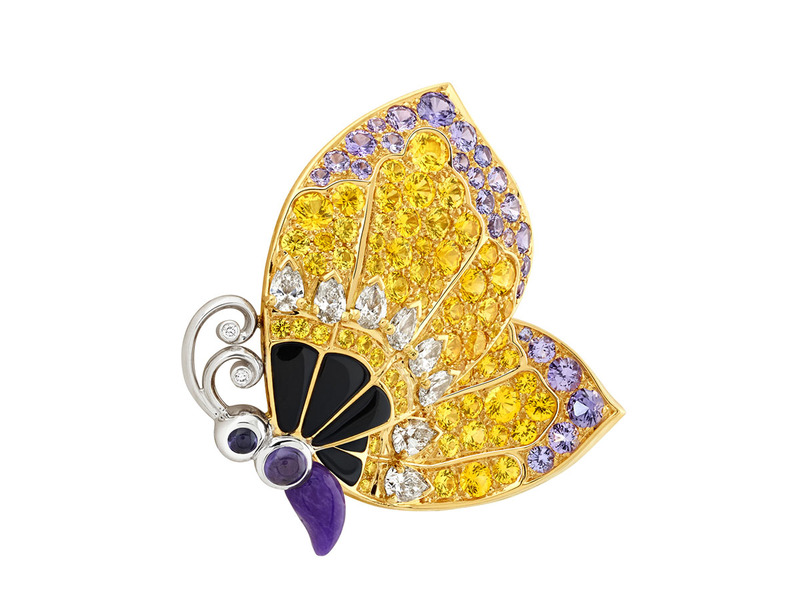 While this virtuoso craftsmanship finds expression in the multiple secrets that nestle at the heart of the “Le Secret” creations, the collection reflects Van Cleef & Arpels’ desire to create surprise and emotion. The French jeweler has after all made mystery one of its best-known signatures, and the theme lends itself to an exploration that is both familiar and inventive. From secrecy to disclosure, each piece reflects the playful spirit of this collection, elevating the art of high jewellery with its revelations of hidden meaning. President of Van Cleef & Arpels in Asia Pacific, style and creativity are two other very important strengths. “We are never out of ideas on how to express our inspiration. It is a very strongly identifiable inspiration, and I believe when you see a piece of jewellery from Van Cleef & Arpels, you get that spirit of a positive vision of life. It’s usually very feminine, inspired by nature and the whimsical worlds of faeries and magical feminine figures,” Catherine explains. “We love fairy tales and love stories, so there are all these positive elements. Asked to single out something from the collection that is a great technical feat, Catherine brings up the parrot clip (called Sous Son Aile) with the chick “hiding” under her wing in a delicate harmony of pink sapphires, coral and diamonds. She also mentions L’École, the School of Jewelry Arts in Paris founded by Van Cleef & Arpels in 2012. “It’s a place for the public to learn about and discover the secret world of jewellery – another way for us to share and protect our know-how. Through these initiatives and extraordinary collections like “Le Secret”, the one thing that stands out is how the maison always remains faithful to its highly distinctive style, characterised by poetry, refinement, creativity and artistic sensibility.